According to NAR, existing-home sales decreased 2.8 percentage points to a seasonally adjusted annual rate (SAAR) of 5.49 million. NAR Chief Economist Lawrence Yun says 2016 was the best year since The Great Recession despite ending on a "softer note." “The Autumn Revival” cooled off in December, but the National Association of Realtors Chief Economist Lawrence Yun said that’s nothing to sneeze at after experiencing the strongest housing market seen since the Great Recession. In December, NAR’s existing-home sales decreased 2.8 percentage points to a seasonally adjusted annual rate (SAAR) of 5.49 million — down from an upwardly revised 5.65 million in November. 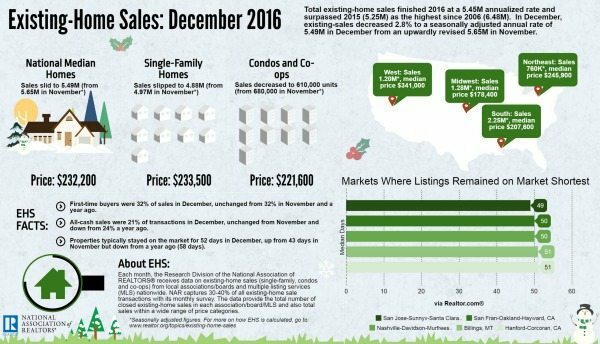 December’s sales pace is 0.7 percentage points above December 2015 and is the highest SAAR sales pace since 2006 (6.48 million). The South stayed steady, while other regions experienced declines, and distressed sales increased 1 percentage point to 7 percent, which is still lower than a year ago. The median existing-home price for all housing types in October rose 4.0 percentage points to $232,200, which marks the 58th consecutive month of year-over-year gains. Meanwhile, total housing inventory took a hit and declined 10.8 percentage points to 1.65 million existing homes available for sale, which is the lowest level since NAR began tracking supply of all housing types in 1999. Inventory is now 6.3 percentage points lower than a year ago — the 19th consecutive month of year-over-year declines. Unsold inventory is at a 3.6-month supply, down 0.4 percentage points from November. NAR Chief Economist Lawrence Yun says December’s existing-home sales are a “soft” ending to the best year since the Great Recession. “While a lack of listings and fast rising home prices was a headwind all year, the surge in rates since early November ultimately caught some prospective buyers off guard and dimmed their appetite or ability to buy a home as 2016 came to an end,” Yun added. Distressed sales, which include foreclosures and short sales, were at 7 percent — a 1 percentage point increase from November and a 1 percentage point drop from December 2015. Five percent of November sales were foreclosures, and 2 percent were short sales. Single-family home sales were at a SAAR of 4.88 million — a 1.8 percentage point month-over-month decline and a 1.5 percentage point increase from December 2015. The sales price for single-family homes increased by 3.8 percentage points to $233,500. Existing condominium and co-op sales took an even bigger hit and decreased 10.3 percentage points to a SAAR of 610,000 units, 4.7 percentage points lower than a year ago. The median existing condo price was $221,600 in December — down 5.5 percentage points from 2015. In the Northeast, existing-home sales dropped 6.2 percent to an annual rate of 760,000, up 2.7 percent from a year ago. Median price: $245,900, a 3.8 percent year-over-year decrease. In the Midwest, existing-home sales decreased 3.8 percent to an annual rate of 1.28 million. Median price: $178,400, a 4.6 percent year-over-year increase. In the South, existing-home sales were unchanged to an annual rate of 2.25 million. Median price: $207,600, a 6.5 percent year-over-year increase. In the West, existing-home sales dropped 4.8 percent to an annual rate of 1.20 million. Median price: $341,000, an 6.0 percent year-over-year increase.